In Pune you’re never more than a few hundred feet away from a place that serves a hot, crisp dosa. I, like many others I know, grew up getting my daily requirement of dosa from Hotel Vaishali. And for most of us Puneris, Vaishali will always remain the golden standard by which all dosas will be judged. When I returned to India a few years back for a brief visit, a friend of mine wanted to take me to a ‘hip’, new dosa joint, which in itself is an oxymoron. We arrived at a place called Dosa Hut, located on the corner where Bhandarkar Rd meets Jangli Maharaj Rd and housed in what used to be the old Café Sunrise. It had just opened when I first visited. The abmience was a little overwhelming for a restaurant that made it’s living by selling dosas. I kept an open mind; that was until the menu arrived. Veg Jaipuri Dosa, Paneer Bhurji Dosa and the killer, I kid you not, Chicken Manchurian Dosa. I understand the need to be different in a saturated marked, but this was just insane (not to mention 40% more expensive than the best dosa in Pune). I looked at the menu once again, because it deserved a second look. My first question was, “why?” So did you just take the ‘masala out of the dosa and just replace it with generic Punjabi and desi Chinese dishes? Or was this an ill-conceived plot to overthrow the almighty naan? Was there any point to completely ruining two good dishes to create one disastrous hybrid? All for the sake of being different. I can’t really remember what I ordered there and but I do remember leaving the place rather confused. And I am not sure if the restaurant is still there either. If one wishes to go against the grain using the dosa, then why not change the dosa itself? I have seen so many recipes from food bloggers that have completely redefined the dosa using new ingredients from oatmeal to ladyfingers. Here’s one of my favourites. Video is fantastic. He is guiness in making dosa I believe. It was very nice reading your post and watching the you tube clip. I like your besan dosai idea. Soes it come out crisp? Love the shape! Looks so good, I'll try it for my fussy kids. thanks. The wanna-be hip dosa in Pune is no different than the americanized dosa in NY - have you been to Hampton Chutney? Same idea - ruins the dosa. Its nice to see the video and the ease with which that man makes dosa - how I wish I could move my wrist that effortlessly while making dosas. My dosas are always disastrous so every so often, i get one at desi restaurants in NYC! Sounds new to me...nice video as well! New to your blog and so very happy to meet a fellow Punekar. I recently went back and had to go and have a kathi kabab roll before I left the city. It took me a while to find the place - the cart is gone and there's a swanky new restaurant in it's place. However glad to report that the huge tava still exists and so does the old menu board. One bite of that chicken roll, I swooned and was transported to food heaven. I just added your site to my bookmarks and will be checking this regularly. Ciao. Me from Pune too !! Man! you have an eye for beauty ! I somehow managed to come to ur blogspace and it was a great reminiscence. I lived in pune for great 2 yrs, and could assocaite to Vaishali, Rangoli, KB, Dorabjee's, FC road etc. It was a fantastic feeling down the memory lane. And the recipes are just mouth watering. I'm sure your wifey is having a wonderful time eating them down. Take time to have a look at my blog. Hi nice to see a fellow Punekar's blog. It's is indeed nostalgic to through your blog as it reminds me of good old days. Sad, to know that Cafe Sunrise isn't there anymore...gosh that was our college group adda!! Hop on to my newly set blog. Haven't you been cooking/writing lately? Its been a while. Go ahead.. make my day! Just saw your blog and was wondering if you would like to write for a magazine? Excellent video..! I think the besan dosa is much like tomato omelet. I don't think Dosa Hut made it there for very long. Last time I checked, Dosa Hut was gone and Sunrise was back. But the interior decor and furniture was still from Dosa Hut, which didn't suit the Sunrise culture at all. This was at least 3 years ago. Not sure if Sunrise is still there. Hey, love your blog's name and everything in it! Also, that's a very professionally presented dosa! Hey Chanchu, nice blog, I'm enjoying thoroughly :) I'm gonna try this recipe for my baby :) The video is really good! The man doesn't even look at the tava! Was wondering why you have not blogged since a long time. Please blog regularly. I love your recipes. This besan dosa sounds a bit like pudla/poora, but thinner. 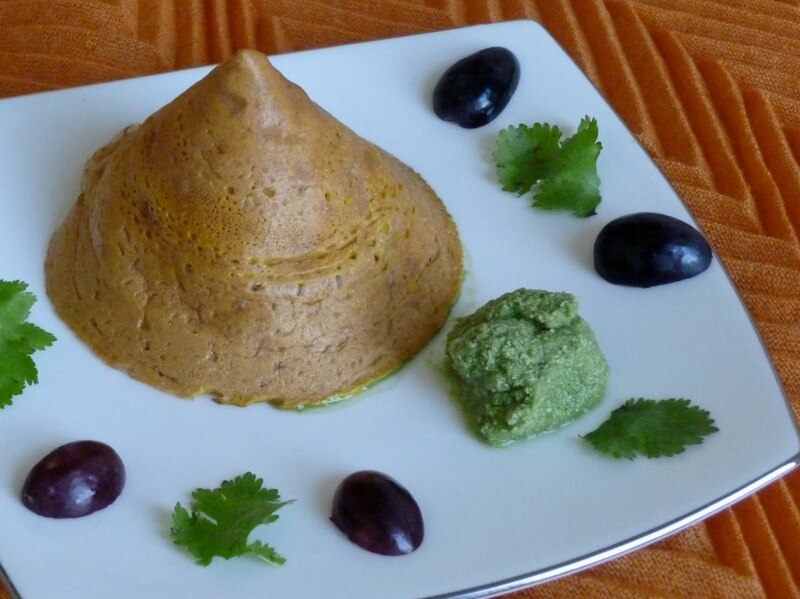 I love besan and am always looking for new dosa recipes, so I will definitely be trying this. Thanks for the recipe. It's easy, nutritious and most all, it's so simple. Dosas have been always a top priorty on an Indian breakfast table. enjoy more at Moti Mahal Deluxe Tandoori Trail, Gurgaon. Appreciate your making the effort to go over this, Personally i think clearly about this as well as really like understanding read more about this particular subject. Whenever possible, while you acquire know-how, could you thoughts upgrading your website with more details? It is rather great for me personally. besan dosa sound nice..i love coconut chutney if possible please post the coconut chutney recipe..
By joining Easy Recipes, we will provide the Nutrition Facts for every recipe you post in which you could customize and add to your blog. Viewers need and love to know the nutritional facts. Its a free service that we offer to blogs and recipes we really love. It looks professional and your members will love it. Simply visit www.easyrecipes.com or contact me at michelle@erecipe.com. We look forward having you in our network! Fantastic and well presented. Dosas have been always a top priorty on an Indian breakfast table. Thanks for the recipe. It is easy, nutritious and most of all, it's so simple.